This System repairs and restores color to any wood surface. Total Furniture Repair System repairs and restores color to any wood surface. Restore scratched furniture to its original beauty! Amazing furniture repair markers make scratches, imperfections, and holes disappear magically, plus restore color to your tables, floors and other wood surfaces for like-new beauty. Set of 6 covers all major types of wood: maple, oak, cherry, walnut, mahogany and black. 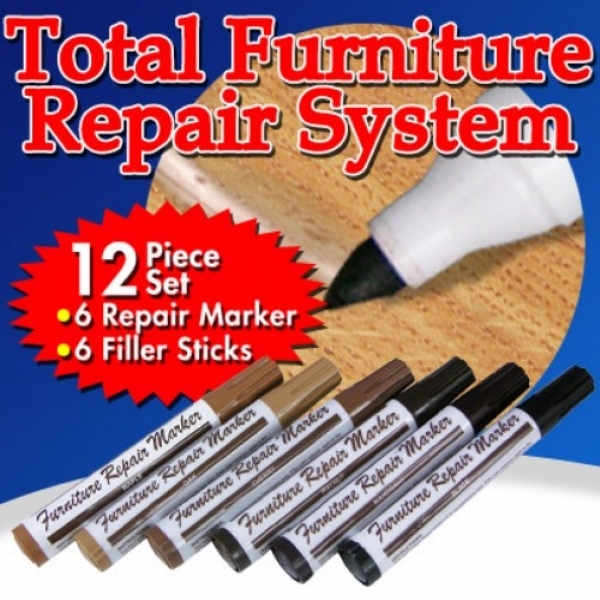 Total Furniture Repair System as seen on TV gives a perfect match every time. Colorfast; dries in seconds. Plus 6 filler sticks that offer wax repair for easy filling and top coating of gouges and deeper scratches. Set of 12; 6 markers and 6 filler sticks covers all major types of wood: maple, oak, cherry, walnut, mahogany and black.